It’s not every day I get to leave work knowing I really rocked out something that was a Very Big Deal, but I did today. The project I alluded to earlier in the week went live today, and all was awesomeness. The Preservation Nation Foursquare badge. Today, the Preservation Nation badge went live on Foursquare. My colleague/friend Alison and I compiled a list of almost 500 historic places around the country for the badge, and while I wrote/edited the historic tips (maximum length 200 characters) and badge copy, Alison moved the paperwork through the lawyers with unprecedented speed, coordinated the badge design, and cut/pasted like a fiend to get all the tips loaded onto the Foursquare website. And now it is out in the wild and it is so. damn. cool. I realize that if you’re not into social media/social gaming this might not sound like much, but trust me. In our world, this is kind of like winning a Game 7. If this is your thing, you need to follow the National Trust (a/k/a PresNation) on Foursquare and… well, I’m not really allowed to say from there, but it’s not hard to figure out how to get your badge. Making today even more full of geeky goodness, the Partners in Preservation launch I mentioned yesterday went really well. I was quarterbacking the live-tweeting of the event/opening of voting from my desk – which is way more frenetic than it sounds – and for a time, our Twitter hashtag (#PreserveNYC) was trending in New York City – “trending” being twitterese for being one of the top-ten most popular things being tweeted about. It didn’t last long, but when I saw it, I actually yelled so loudly that I scared the rest of the folks in the office. The Partners in Preservation thing is pretty cool, by the way. Forty sites in NYC are competing for three million dollars in grants – and a popular vote helps to determine who wins. (It’s a little like peewee soccer, though, in that there aren’t really any losers – the top four winners get their full grant request, but the balance of the $3MM will be divvied up among the other 36 sites.) Being from the Empire State myself, and knowing some of my family and friends from back home read this, all I can say is, swallow your Upstater pride, and help the city out on this one. The sites are great and their preservation projects are worthy. Go here to vote – 0nce a day, every day, until May 21. And with that, I’m going to bed. I have no idea how I’ve lasted this long. Exhausted. 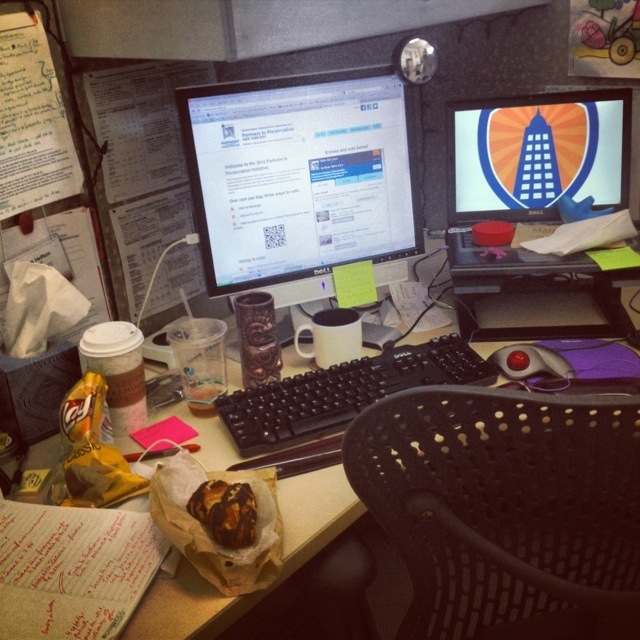 In the immediate aftermath of today's launch, my desk looks like the professional equivalent of a dorm room during finals: cluttered, and covered with coffee cups and half-eaten food. Congrats on the wins: Foursquare badge, trending, and hockey! The picture of your desk is priceless! Congratulations! It’s always great to see hard work get let out into the wild. FANTASTIC!!!! And…..I’m voting! I’m so happy for your success with all this. If you’re looking for some more nifty historic sites in the Capital Region, let me know. Schenectady County has some really cool old places. And congratulations! My inner (and outer) geek is thrilled for you. from one geek to another: Það er frábært starf – til hamingju! Hafa bjór og sumir dýrindis mat!